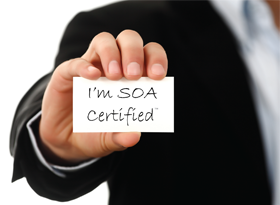 Pearson IT Certification has partnered with SOASchool.com to provide IT professionals with helpful information, tips, and guidance for preparing for SOA Certified Professional (SOACP™) exams. The SOA Certified Professional (SOACP) program is dedicated to excellence in the field of SOA and service-oriented computing. Through a series of seasoned course modules and exams, IT professionals have the opportunity to obtain a number of different certifications to recognize their accomplishment of gaining project-ready SOA proficiency. This vendor-neutral program was developed in cooperation with best-selling SOA author Thomas Erl and several major SOA organizations and academic institutions. Through the involvement of the SOA Education Committee, course contents and certification requirements are constantly reviewed and revised to stay current with developments in the service-oriented computing industry. To learn more, visit www.soaschool.com. A Certified SOA Trainer can travel to your location to deliver a workshop for a class of students, based on your budget and preferences. To learn more, contact info@soaschool.com. Certification workshops are held on a regular basis in major cities around the world. Visit www.soaworkshop.com for the latest calendar. Self-Study Kits are available for all exams. These kits allow you to study the materials remotely and at your own pace. Each kit includes study materials, Audio Tutor CDs, a Prometric exam voucher, and additional study aids. For more information, visit www.soaselfstudy.com. 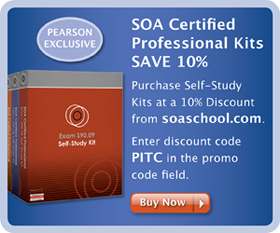 Pearson IT Certification is offering an exclusive 10% discount when you purchase any SOACP self-study kit or self-study kit bundle from SOASchool.com. Use discount code PITC at checkout. The Prentice Hall Service-Oriented Computing Series from Thomas Erl is the world's top-selling book series dedicated to SOA and service-oriented computing topics. These books are authored by industry experts and each title is required to follow common style and language conventions to ensure consistency with the ultimate goal of establishing a de facto library comprised of fully complementary titles. The books in this series are part of the official SOACP curriculum and several SOACP self-study kits require one or more of these textbooks. To view the relationship between series titles and individual self-study kit course modules, visit www.soabooks.com/courses/. To become certified you only need to pass the exams required for a given certification. The aforementioned training options can all help you prepare for these exams. To learn more, visit www.soaschool.com/certifications/. Note that testing and certification are optional. You can take any of the training courses without having to take the exams. Exams are available worldwide via Prometric testing centers. To view locations and to schedule exams, visit www.prometric.com/soacp/ or call 1-800-897-2241. For descriptions of the exams and to learn more about exam scheduling and testing center locations, visit www.soaschool.com/exams/.